How do you have to step up your ability to be outgoing in certain situations when you are working in academia? You might not expect a person in the National Academies for Engineering and Science to say that self-doubt still resonates at times. But Professor Bruce Rittmann can still get in touch with that feeling and identifies himself as shy. Dr. Rittmann shared his processes for practicing the outgoing role when he identifies as an introverted person. We also discussed his approach to funding, including some creative approaches he has taken to “kissing the frog.” It was a privilege to have Dr. Rittmann on the show and we can all benefit from his seasoned approach to 45+ years in academia. 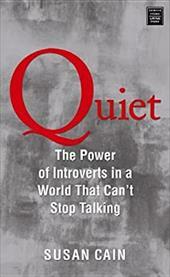 Quiet - The Power of Introverts in a World That Can't Stop Talking Price: At least one-third of the people we know are introverts. They're the ones who prefer listening to speaking, reading to partying.